This new riven faced limestone has hand fettled edges with a polished foot worn polished surface, which produces an authentic antique floor, that is so appropriate to older building but also very contemporary to new. With its pale and cool tones this limestone flooring is hard as nails and is suitable for both domestic and commercial situations. 560mm width x random lengths (500mm to 850mm). * Authentic reclaimed flooring look. * Time worn stone surface & edges. 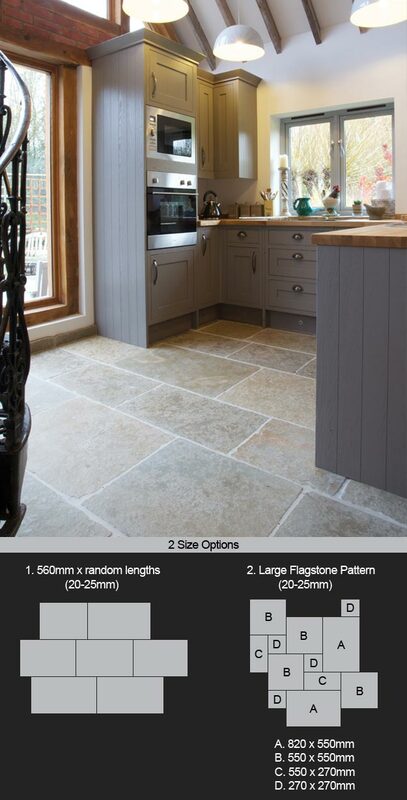 * 2 traditional flooring patterns. * Ideal for domestic & commercial.